What is the new Club Stand? The new Club Stand will offer a superior event experience unsurpassed by any other racecourse in the world where visitors can enjoy the best hospitality, entertainment and racing. Why is the VRC building the new Club Stand? The VRC announced its Masterplan in 2010, with the construction of the new Club Stand our priority as the Members Old Grandstand approached the end of its useful life. The Masterplan ensures the VRC will continue to deliver significant economic benefits to Victoria and retain its position as an internationally recognised major events venue. The VRC is excited to announce the construction of the new Club Stand is on track, and is to be completed before this year’s Melbourne Cup Carnival. Who is the builder and why was this company selected? The VRC appointed Multiplex to manage the construction due to its strong credentials in delivering milestone projects including, Melbourne Convention Centre, Federation Square, Wembley Stadium (London) and Crown (Perth). Who is the architect and why were they chosen? The Club Stand has been designed by leading architectural firm Bates Smart due to its experience with milestone projects, which have included the Royal Children’s Hospital Melbourne, Federation Square and Crown Casino. When will people get to see the internal designs? In May, the Members Dining Room, The Byerley, Straight Six, Bluegrass Bar, Furlong Bar, The Bakery and The Arbour were revealed. We look forward to unveiling more elements of the new Club Stand to Members over the coming months, including some very exciting announcements including collaborations with partners that will set a new benchmark for raceday entertainment. What are the stand-out features from the designs announced so far? The Roof Garden is a spectacular new addition to Flemington, and will house bars, betting facilities, food outlets, a DJ booth and extraordinary views of the track and Melbourne’s city skyline. 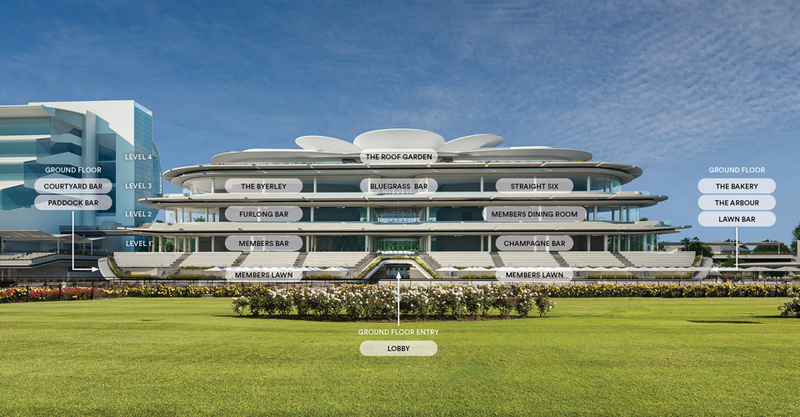 The Roof Garden draws inspiration from Flemington’s famous garden setting with the shapes and forms of flowers echoed through the top level of the Club Stand. The Roof Garden is unlike anything we have seen at venues across Australia and internationally. World-class bars and food outlets are complemented by a stylish garden setting, which really embodies the essence and spirit of a marquee during the Melbourne Cup Carnival. 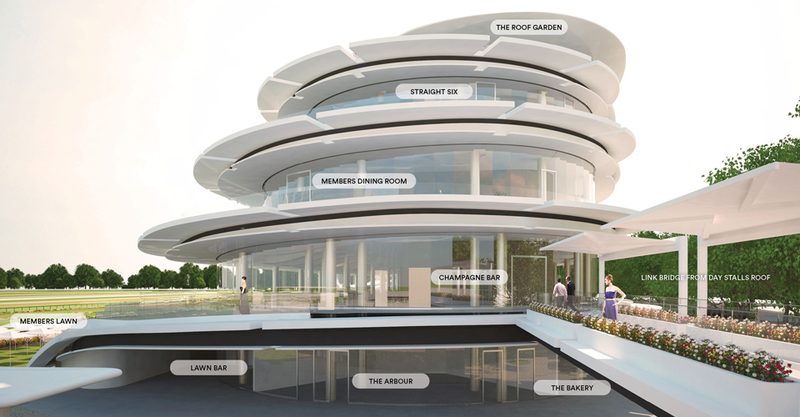 The new Seating Deck will see an unprecedented opportunity for racegoers to watch and enjoy the races outside with access to elevated viewing podiums and outdoor seating across three levels. 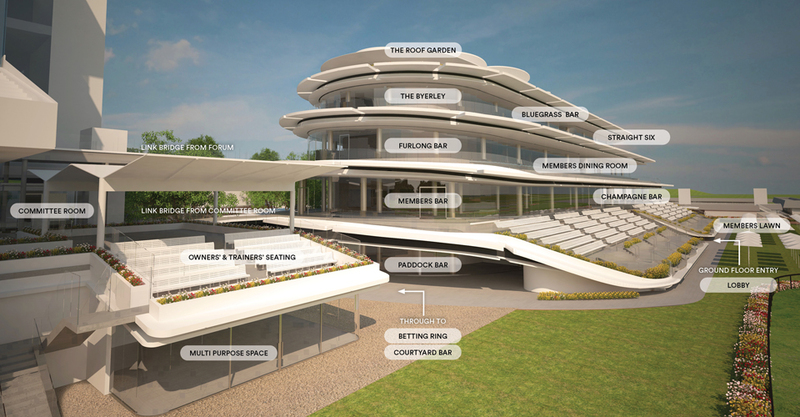 The Members’ Bar will be at the heart of the Club Stand, and will have direct access to the energetic atmosphere on the Members’ Lawn and seamless access to the Betting Ring. How do the designs announced today incorporate the history of the VRC? The new Members’ Bar will really be at the heart of the club stand. We wanted to pay homage to the history of the VRC, so the Members’ Bar will feature wood panelling and treasured items from the Members’ Old Grandstand woven throughout. How many seats are in the new Club Stand? Is it less/more than the Members’ Old Grandstand? There will be more than 2,000 grandstand seats and with all the viewing opportunities within the venues of the Club Stand, will comfortably allow for a greater number of Members to enjoy the racing action than ever before. The number of Members able to view the races will exceed the previous offering of the two seating decks in the Members’ Old Grandstand. Were Members consulted about the designs? The VRC values its Members feedback and has conducted many market research focus groups regarding the design of the Club Stand. Will the construction of the Club Stand affect the raceday experience? The VRC will do everything it can to ensure racegoers can continue to enjoy their raceday experience at Flemington during the construction phase. Where will Members go while the Club Stand is being built? 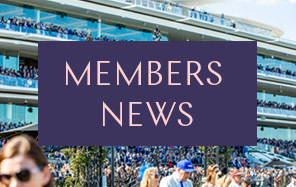 The VRC has plans in place to ensure Members can continue to enjoy the races. The VRC will accommodate Members and guests so they can enjoy all that Flemington has to offer during what will no doubt be another spectacular event. There have also been thoughtful investments made in refurbishing The View and The Peak to provide fresh new spaces for Members and their guests to enjoy while the Club Stand is being built. When will the Club Stand officially open? The Club Stand will be ready for VRC Members and their Guests to enjoy at this year’s Melbourne Cup Carnival. When can I purchase tickets/dining/hospitality in the new Club Stand? Communication of pre-booked dining in the Club Stand will be shared with Members in the Melbourne Cup Carnival guide in July. All Members will be informed and given the opportunity to book in a fair manner. How will the new Club Stand benefit the wider community? Outside of Flemington racedays the VRC will look to open further facilities to the general public for use. As part of the VRC’s Masterplan released in 2010, the Club intends to develop new facilities at Flemington for Members and the public. The project will see an estimated 350 people employed during the planned 20-month construction period with significant flow-on benefits for the Victorian economy. How will construction impact the local community? The VRC currently has processes in place to manage the project as efficiently as possible to minimise disruptions to the community. Once the Club Stand is completed, does this mean there will be more events/racedays at Flemington? How will this impact the local community? 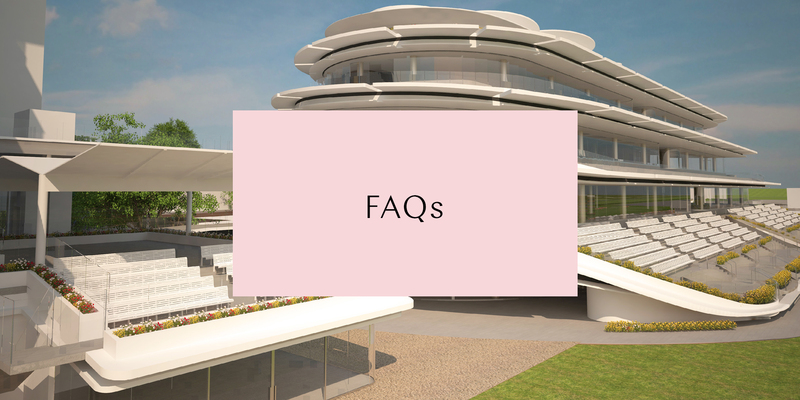 Flemington Racecourse is currently used 365 days of the year and the VRC will share any updates to the events calendar with the community should anything change. How will the construction phase affect trackwork and raceday operations? The VRC’s project team is working collaboratively with stakeholders to manage operations effectively. How will the Club Stand benefit industry? The Club Stand is one example of how the VRC is committed to continually investing in infrastructure to enhance Flemington Racecourse for the benefit of racing participants. Why are there fewer spaces for bookies now? The VRC considers bookmakers as an essential and integral asset to Flemington and they play an integral role in enhancing the raceday experience. The new Betting Ring was designed in consultation with the Victoria Bookmakers Association (VBA) and will have a 14 bookmaker ring. 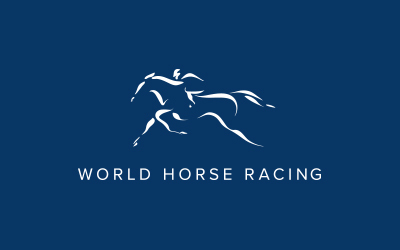 The design caters for both Members and also double side onto the Public Betting Ring with options to increase the size of the Betting Ring during the more popular race days. There will also be Bookmakers on each level of the Club Stand, with infrastructure being put in place to cater for greater numbers if required. How much will the new Club Stand cost? The Club Stand is expected to cost more than $128 million. How is the new Club Stand going to be funded? The Club Stand will be funded through a mixture of debt and operating profits/cash. We have also secured support from government and industry. The VRC has sold a parcel of land on Epsom Road, which will help fund infrastructure upgrades at Flemington Racecourse to secure its future as a world-class entertainment venue and allow it to continue to provide greater benefits to Victoria and the wider community, racing industry, VRC Members and event patrons. Have you received funding from government or industry? We are proud to be working with the government, industry and a number of partners to bring the Club Stand to life, marking the next step in the Club’s renewal plans for Flemington Racecourse. How much funding will be provided by government? This is a matter for government to comment on. How much funding was provided by RV /Tabcorp and others? Has appropriate heritage approval been granted? The VRC was obliged to undertake an approval process which was granted by Heritage Victoria.